Extremely cold and dry temperatures throughout Oklahoma have golf course superintendents concerned about damage to their Bermuda fairways and, for a growing number of courses, their ultra dwarf Bermuda greens. Now that the extreme cold has lifted, superintendents and other managers of athletic turf fields will be scouting their turf by brushing away the dormant canopy and looking for signs of green, red or purple shoots, all indications the Bermuda is still kicking. 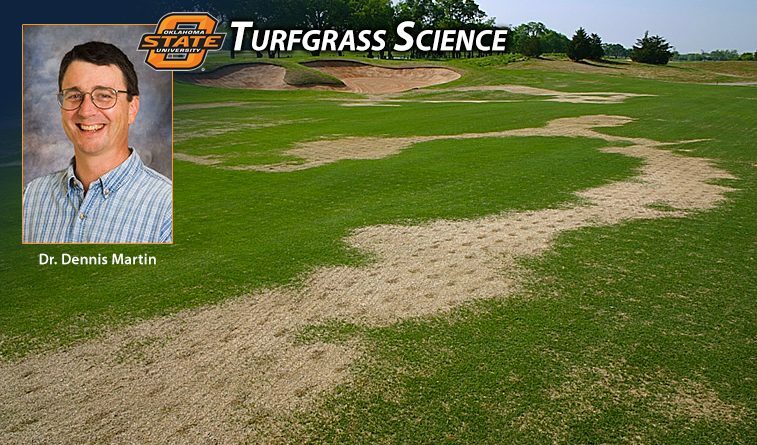 Dr. Dennis Martin, a turf grass research specialist at Oklahoma State University, said that with the weather that has occurred thus far, he is not expecting to see the devastating amounts Oklahoma golf courses suffered in the winters of 1989-90 or 2009-10, two of the worst years on record for winter kill damage. However, he warned that areas on north-facing slopes or high compaction areas where golf cars frequent will be particularly susceptible to winter kill. Martin said he suggests waiting a full seven days from the last extreme temperature event to test. Interestingly, Dr. Martin is concerned more about ultra dwarf Bermuda greens surviving the extreme temperatures than he is about mass die off of fairways. This is even if courses have followed the proper procedures for covering their greens. Due partly to their low height and natural compaction as areas where all golfers gather, ultradwarf varieties are regarded as more susceptible to winter kill than Bermuda grasses used in fairways and roughs. The covers are a good guard, but only if the greens were properly cared for and watered before being covered and given moisture again when uncovered. Martin said he expects spring dead spot to be more prevalent than normal this spring but at this point is hoping that courses losing a significant percent of turf coverage will be very rare. As a tropical plant adapting to thriving in sub-tropical climates, Bermuda grasses have become more cold tolerant over the years, some by adapting naturally and also through research such as that conducted at Oklahoma State. Martin said that due to climate change and global warming, the transition zone’s northern boundary keeps moving north and courses farther north are tempted to try Bermuda grass either on fairways or greens. Courses in areas such as Missouri and Maryland have recently converted to Bermuda grasses and it will be instructive to see how they survive such a severe stretch. Below are a few images from a study by Dr. Martin on how to assess and recover from winter kill. To see the complete study, click here. Source of presentation and images credited to Dr. Dennis Martin unless indicated otherwise.